Vegan Waffles - easy to make and super versatile, freezer-friendly! 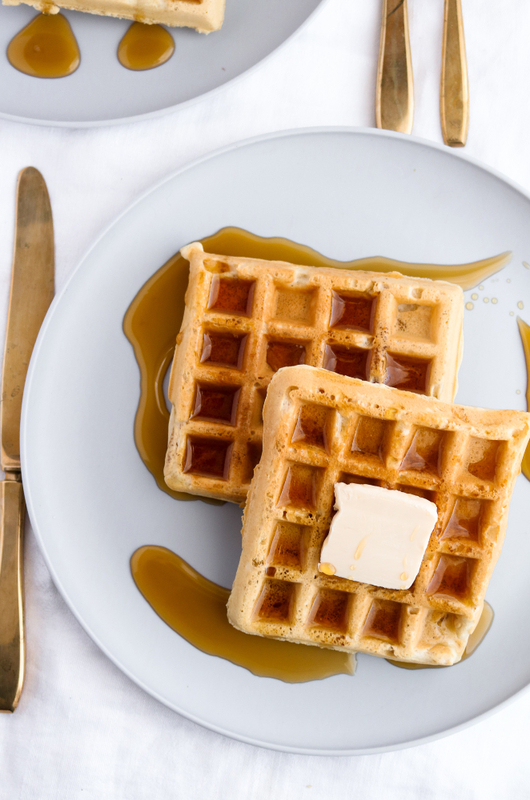 Easy, 10-ingredient, freezer-friendly and toaster-friendly homemade vegan waffles. Simple enough for the beginner cook to dazzle and the perfect addition to a Sunday brunch… or a Thursday dinner! T here!! A couple weeks ago, we had our winter break from school. 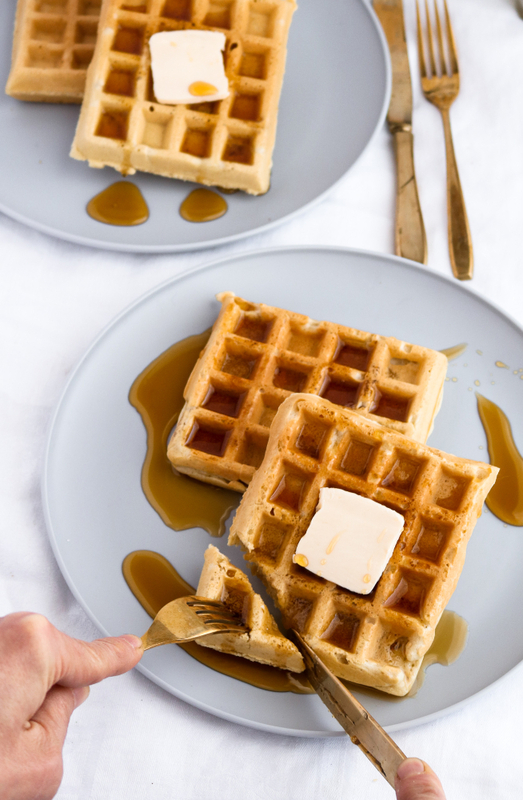 As many of you know, my free days and snow days are the times I LOVE to experiment in the kitchen, and we’ve used that time to put together a nice, simple recipe for one of the most beloved American breakfast dishes: waffles. These aren’t your regular old frozen waffles. The waffles we have here are the type of waffles you order when you’re out at Sunday brunch and you say “I want something special. I want waffles.” These are the waffles you get when you order room service. You might be thinking “but pancakes! !” Pancakes are great; but if you’ve got a waffle-maker (We use this one. ), you can take great up to sublime. 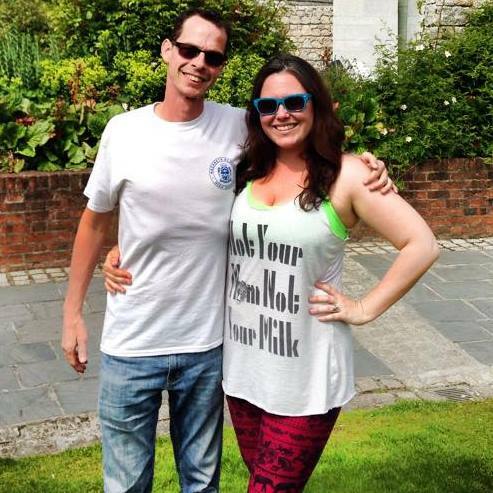 And, friends, on a scale of one to ten, “these go all the way up to 11”. Also, and I might be letting you in on a little secret here, waffles are actually EASIER. That’s right! I said it. Drop some batter in the waffle-maker, shut the lid, and wait for the green light to go off. No tentative flips; no “first pancake” law of the universe. You just need some basic ingredients we’re almost certain you’ll have around your kitchen: all-purpose flour, non-dairy milk, sugar, oil, some basic seasonings. Even a budding chef with a decent waffle-maker and the slightest amount of patience can create vegan waffles to dazzle and delight. Do NOT overfill the waffle maker. Remember, the waffles will expand a bit while cooking and overflow of the batter can be quite messy. You’ll get the hang of this very quickly. Our specific waffle-maker takes about a little over ¼ cup per waffle. You’ll be tempted to lift the lid and look inside to see how the waffles are progressing. DO NOT DO THIS! Wait for the indicator light to do its job. I like to let cooking continue for about 30 seconds after the indicator light goes off to ensure doneness. Don’t lift the lid too quickly when opening: it may tear the waffles. Slow and steady. Don’t pull the waffle from the heating plate if it sticks; rather, work it gently. Sometimes a plastic spatula can help pull the sides free. Speaking of spatulas, I like to keep a rubber spat handy to get ALL the batter from the bowl. The only problem left to solve is how you’re going to present these beauties: With melted vegan butter drowning in little square pools of maple syrup? Piled high with strawberries and dairy-free whip? Chick’n and waffles? Waffle triangles with jam and vegan clotted cream? (Seriously though, how fancy does that sound?) Waffles with peanut butter and sliced apples? Chocolate chip waffles? Blueberry waffles? Dessert waffles? Oh! One more thing: Waffle. Ice cream. Sandwiches. You. are. welcome. Actually, on second thought, you should just have a waffle-bar party. Note: this recipe can also be used for pancakes… if you really want to treat your friends and family that way. 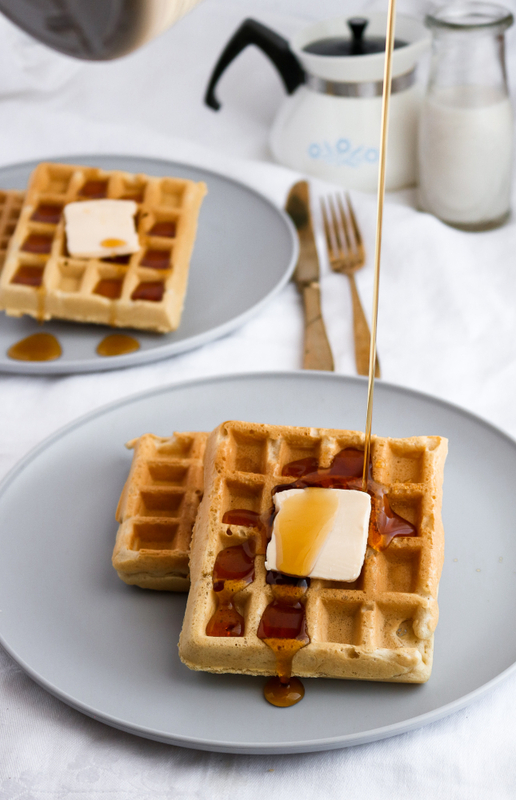 Easy, ten-ingredient, freezer-friendly and toaster-friendly homemade vegan waffles. Simple enough for the beginner cook to dazzle and the perfect addition to a Sunday brunch… or a Thursday dinner! First, combine all your dry ingredients together in a large mixing bowl and create a crater in the middle. Then, combine your wet ingredients in a smaller bowl and whisk together. Pour the wet ingredients into your dry ingredient crater and mix well by whisking together until smooth. Shut the lid and be patient. It’s like, 3 minutes or so, you can do it. When the indicator light shows and the waffles are done, open the lid slowly, carefully remove the waffle, and place in warm oven to hold while you repeat last four steps with the remainder of the batter. Go traditional or get creative and ENJOY! Cooking time and the amount of waffles this recipe makes will vary depending on your waffle maker. Just follow the instructions for your specific waffle maker! We use this one - which is rather affordable + works like a charm.